For the most part I try and not write about chain restaurants but on occasions I can’t resist. This is one of those occasions. I recently had breakfast out on a Sunday morning at Peach Valley Café. This establishment is owned and operated by the Stonewood Grill & Tavern folks. Stonewood has about 16 locations (including Dr Phillips and Lake Mary) in Florida and they have have one location in North Carolina. Peach Valley has about 4 locations in Florida, and growing. I went to the Peach Valley location in Dr Phillips in Southwest Orlando off of Conroy Rd, and ironic enough the older brother Stonewood restaurant is right next door only about 30 yards away, interesting business strategy they have, I might add. What sets Peach Valley apart from Stonewood is Peach Valley is only open for Breakfast and Lunch only, and Stonewood is mainly a place for dinner. The Peach Valley location I was at had seating outside and seating inside and they also have counter service, I like these 3 options. We choose for inside. I am glad we did. I guess and assume this place is pet friendly? I witnessed several folks eating breakfast outside who brought their dogs with them. Personally I would never do this nor would I have a desire to do this. I love animals, and dogs are no exception but there are places you bring pets and places you don’t. I don’t believe in bringing pets to a restaurant, even if outdoor seating is available, period. I bet you even Cesar Millan would even agree with me on this one?? Anyway back to my breakfast experience. 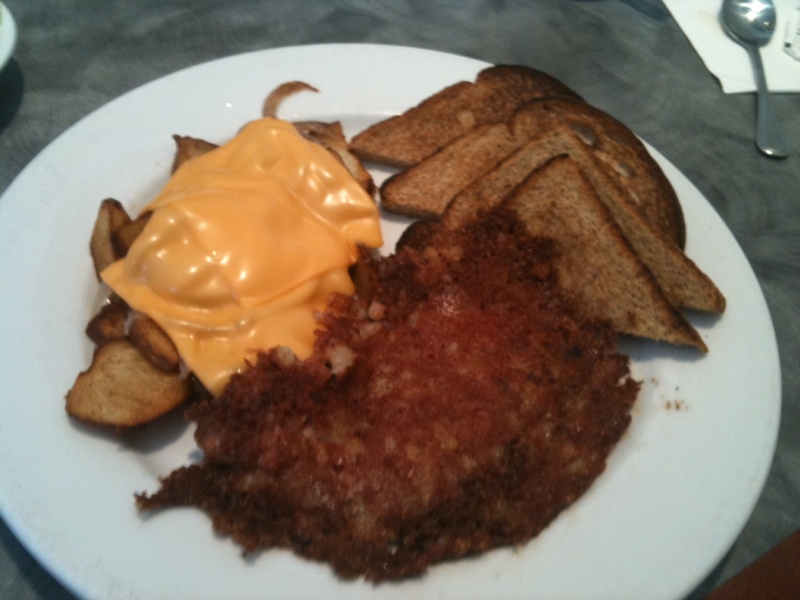 I ordered the corned beef hash extra well done, the house potatoes and wheat toast $8. The corned beef was cooked perfectly to the requested extra well done, this gave it a nice crispy crust to its texture. It was seasoned with just the right amount of salt and pepper; it was not overly greasy like some corn beef hash you order. Its probably the best corn beef hash I have had in a long long long time…. The fresh chopped up cube potatoes were fried up well and crisp and seasoned up well with onions and peppers in them. I also added cheddar cheese to my breakfast potatoes. The cheese added a nice dimension of flavor to the potatoes, onions, and peppers, yes I know, lots of calories here, but those cheese potatoes were worth the extra calories. I also had the wheat toast. It was a nice big piece of toast that was filling. On my next visit I had the Buttermilk Drop Biscuits & Sausage Gravy. It came with two big freshly baked biscuits topped with homemade sausage gravy. Wow, talk about good. These biscuits were almost as good as my Granny’s. It was served with plenty of sausage gravy; it was a very nice size portion. My guests ordered Buttermilk pancakes. It was the classic buttermilk pancakes dusted with powered sugar and served with warm syrup. Trust me, you won’t leave hungry after you visit Peach Valley. The service was good and attentive and friendly. If you go ask for Diane, she was a great attitude and you can tell she likes what she does. If you are like me, you don’t usually go out for breakfast and lunch everyday of the week, so when you do, you want to go to the restaurant or café where you know you’ve going to have the vibrant, delicious flavors you crave. Peach Valley delivers on this, plus their dishes are very hearty. 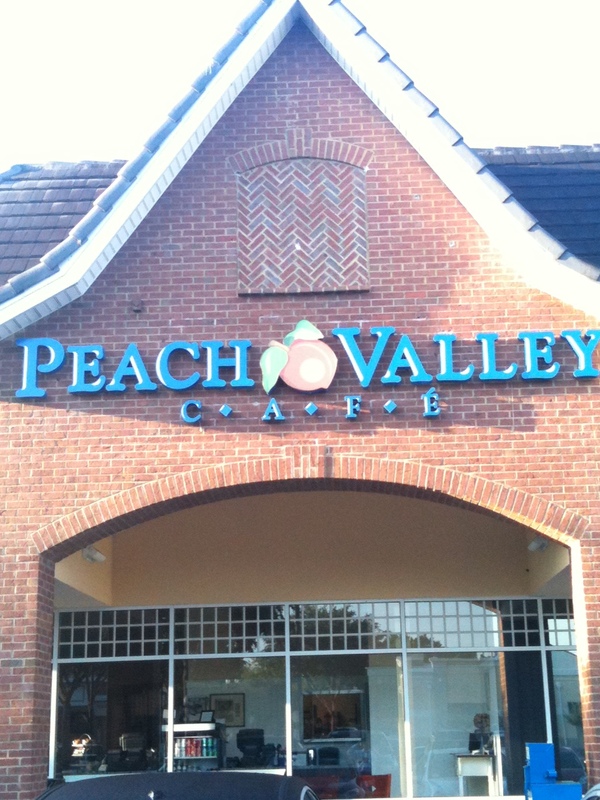 Peach Valley is open Monday – Friday 7am-2:30 and Saturday and Sunday 7am-3:30. Plenty of parking is available.